The Egyptians call it Raks Sharki or Oriental dance the Greeks Cifte telli, we call it Belly dance, which was first named by the French as The dance of the stomach and translated into English. But I feel we have appropriately named it, as Belly dance originated as a women’s dance of fertility and centres around the womb. It incorporates abdomen moves such as belly rolls, circles and flutters and was the first form of childbirth preparation. It has been told that in ancient times the women of the village would dance around the expectant mother in labour encouraging her to copy their rhythmic pelvic moves to assist with contractions and the babies movement down the birth canal. This birthing ritual is still performed today by some Berber people. And in Egypt today it is still customary for the bride and groom to hire a belly dancer and to take a picture with their hands on the belly dancers stomach. Belly dance originated in the temples of Egypt over 4,000 years ago and was danced by the temple goddess for religious ceremonies. Dance was a part of their culture. Labourers would work in rhythmic motion, sounds, song and percussion. There was dancing in the streets, dancing at festivals and banquets, combat dancing and dancing in the harems. The street dancers or gipsies spread this dance throughout Egypt, The Middle East and Europe. 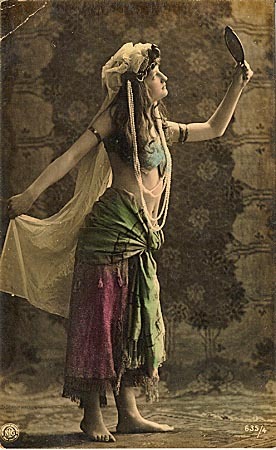 The dance was influenced greatly by Indian Gypsies in 1500B.C. and has melded and fused into many dances in different cultures such as Turkish, Lebanese, Greek, Saudi and Spanish dancing. Today Belly dancing is spread right throughout the world and is becoming increasing popular in Western Cultures. The dance styles are so varied within belly dance you can be as creative and imaginative as you like from sword, stick and veil dancing to fast drum solos and slow sensual snake like moves. When people want to celebrate, they dance. Apart from honouring their femininity and reclaiming their connection to the Goddess Within; women who dance today do so for very practical reasons: for fun, fitness and for friendship.